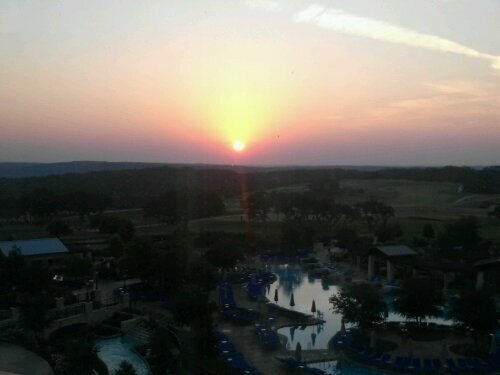 Well it was another HOT day in San Antonio, Texas at the 2012 ODTUG KScope conference. It was something like 104 degrees outside with a Heat Index of 107. But it was more like 65 degrees in the session rooms. They do like to keep it cold inside here in Texas. But the topics and speakers were hot anyway. After an energizing session of Chi Gung this morning, my first session to attend was Mark Rittman talking about Exalytics and the TimesTen in-memory database. Based on the number of people in the room at 8:30 AM, I would call this a hot topic for sure. 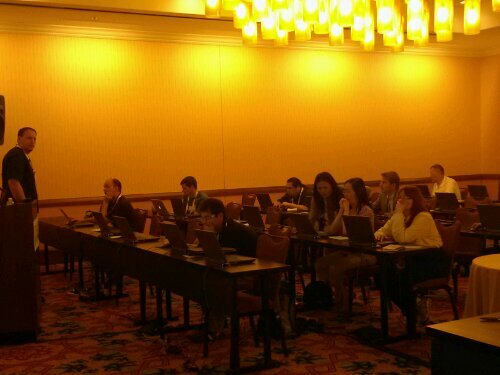 Inquiring minds want to know if this Exalytics stuff is all it is cracked up to be (and worth the $$). Mark did his best to give us the low down, candid truth. Mostly it was good news. So what you ask? Well that technology tracks all the quesries run in your OBIEE server and figures out which summaries would help speed up your performance. Now you won’t get your entire data warehouse up in memory, but you will get the most used data set up to return faster. The biggest gotcha is that it does not know from automatic incremental refreshes, so you have to use ODI or some scripting to refresh the TimesTen database automatically. Anyway, the future does look bright for Exalytics. 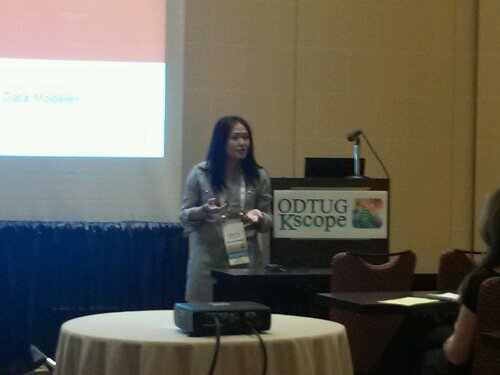 Next up was Ashley Chen, Oracle Product Manager, talking about the new features in the 3.1 release of SQL Developer and SQL Developer Data Modeler. Notably in SQL Developer there is now some APEX Integration and TimesTen integration, along with improved DB Copy and DB Diff utilities. Plus they have re-done the Oracle web site for SQL Dev to segment the tool into more logical groupings of functionality. 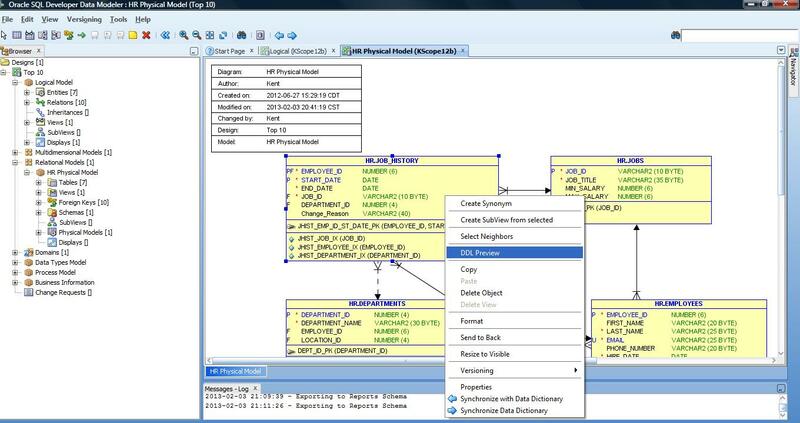 On the Data Modeler side, new features include Easy Sync to DB, better versioning support, a better, modifiable meta data reporting engine, and the new Query Builder for developing and testing the code for an Oracle view (I wrote about that here). 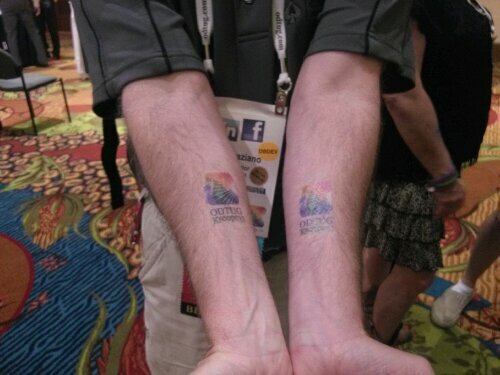 Then it was bit of a break while I interviewed JP Dijcks in the ODTUG Social Media Lounge and then got my set of ODTUG tatoos. Next it was lunch and the Oracle ACE and ACE Directors Lunch and Learn sessions where we divided the rooms by topic area and had the various Oracle ACEs answer questions and lead a discussion about topics in their area. 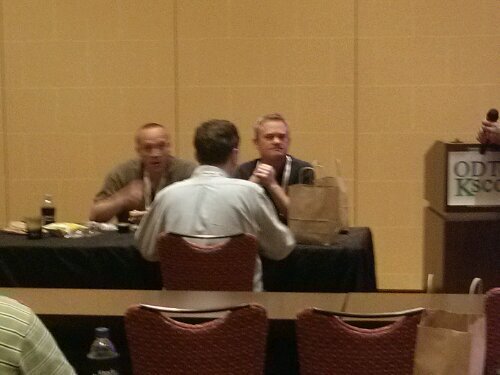 Here are a few of the BI ACEs plotting their strategy for the panel. 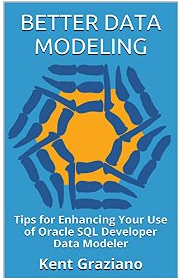 They did end up asking me to join the panel, so I got to field a few questions about data modeling, big data, and where to build a metrics model in the OBI RPD or the database? It depends…. 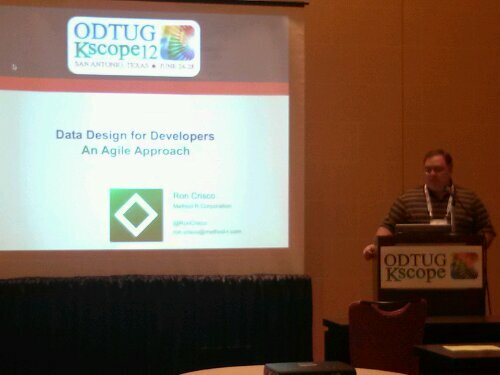 After lunch I attended Ron Crisco’s talk about Agile and Data Design. A favorite topic of mine! How do you keep it in sync with ongoing changes and implementation? He kept this all in context of the principles in the Agile Manifesto and the goal of delivering useful software to the business. I finished the day hanging out with the Ashley Chen and Jeff Smith in the Data Modeler lab session as folks tried out the new features on a pre-configured Oracle VM. Ashely and Jeff kept busy helping folks while I tried to get the new VM running on my laptop. No luck. Maybe tomorrow. I did get to help a bit and answer a few questions for some of the participants. No official KScope events tonight so I got to spend a little time relaxing by the pool and in the lazy river with my friend JP and his family. Saw several other friends and collegues as well with their spouses and kids playing in the pool. Then we all got to watch Despicable Me projected on a sheet on the far side of the pool. Pretty neat. Nice way to end the day. Tomorrow should be another exciting day of sessions and then we have the BIG EVENT: we all saddle up and head out to the Knibbe Ranch for BBQ and a real Rodeo. See ‘ya at the round-up tomorrow, y’all.